Padre Island, located along the Gulf Coast of Texas, is one of the longest stretches of undeveloped barrier islands in the world. It attracts migrating snowbirds like ourselves as well as thousands of migrating birds in the winter months. In our quest for beaches suitable for RV camping, we discovered that Padre Island National Seashore has one of the few places where RVs can actually drive on the beach to park near the water. Our very first experience RV camping on the beach was on South Beach of Padre Island National Seashore right on the Gulf of Mexico. As snowbirds, or ‘Winter Texans’ as the locals say, we joined the many Northerners who converge on Texas to escape the cold winter of northern climates. There is much to attract nature lovers to North Padre Island. The Kemps Ridley sea turtles migrate to the Texas coast and nest from April to August between Galveston, Texas and Tamaulipas, Mexico. It is the smallest sea turtle and also the most endangered. This protected species is the only sea turtle known to nest in the day time. Its primary nesting territory is the Gulf Coast of Texas. Many winter visitors come to bird watch as more than half of the bird species in the U.S. are seen on Padre Island during the winter months. The National Park Service offers free birding walks led by knowledgeable volunteers or Park Rangers for those who would like help in spotting and identifying some of the species found here. We particularly enjoyed seeing the tall sand hill cranes that migrate here as well as pelicans, bitterns, skimmers, terns, long billed curlews, sanderlings, herons and other coastal birds at Bird Basin. 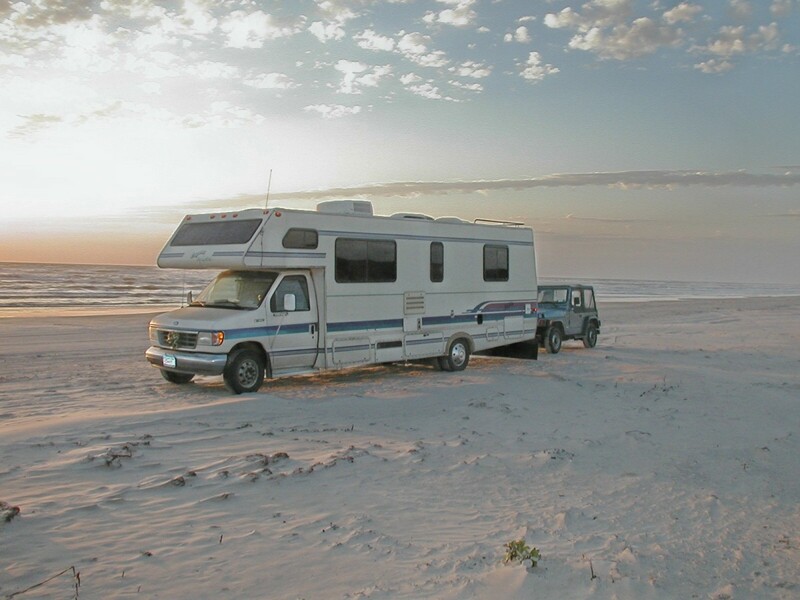 Padre Island National Seashore has several options for RV and tent camping. As we were traveling in an RV, we were concerned about availability of fresh water and a dump station. The important thing to know before you drive your motor home to the Padre Island National Seashore is that all campgrounds are dry camping only; there are no utility or water hookups at any campsites. There is one dump station and a place to get fresh water. Most self-contained motorhomes and trailers are perfectly equipped to handle a week or two of dry camping, but it is important to know ahead of time what to expect. Royal Terns Visit the Beach on Padre Island. The first place we wanted to try camping was on South Beach where RVs and other vehicles can drive on the sand and park on the waterfront. The idea of camping right on the beach appeals to many people, and we were certainly anxious to try it. Beaches on in Texas are considered highways, and the same driving rules apply to beach driving as to any Texas roadway. All vehicles driving on the beach must be legal street vehicles, and drivers must be licensed drivers. 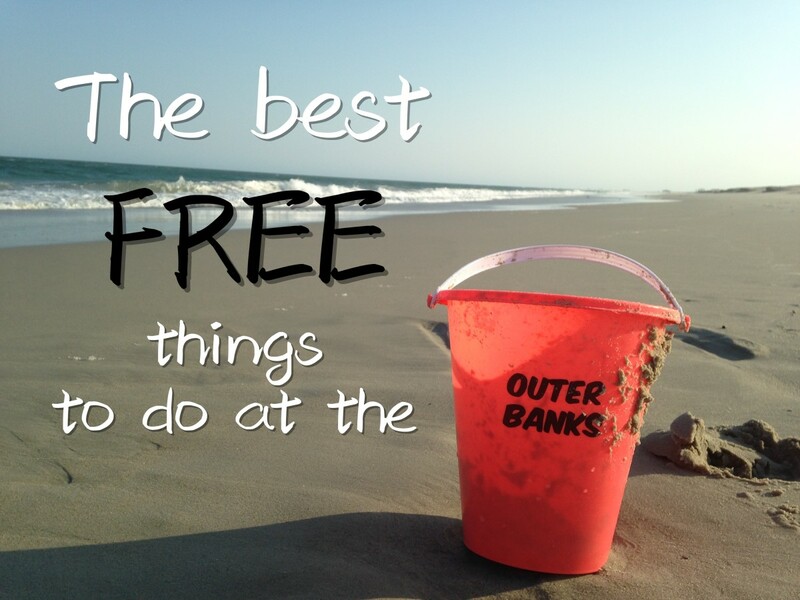 Camping is free on the beach, but you will need to carry out your trash, and drive off the beach to the dump station when you need fresh water or need to dump. There is a chemical toilet and dumpsters at the entrance to South Beach. There are cold water showers at the Malaquite Visitor Center and a dump station and water filling station near the Malaquite Campground. It is safe to drive 2-wheel drive vehicles on the beach from the access road and many people drive motor homes and campers out onto the sand where they can park at the edge of the Gulf of Mexico. However, anyone who drives on the beach does so at their own risk, and there are some important tips for driving on the beach. First: While the sand is usually compact enough for easy driving, you can get into trouble if you drive too close to the water's edge or if you drive into the softer sand closer to the dunes. Stay in the driving lanes! Although we've had a lot of experience driving our jeep in beach sand, driving a motor home was different. We ended up getting stuck because we drove too close to the dunes when turning around. Luckily, a Ranger came along to help get us out, but it was embarrassing. Second: There may be times when the wind isn't blowing, but we've never experienced them. When the wind blows, it means that the sand is blowing and will sift into your rig. Leaving windows open on the windward side of the rig can mean lots of sand in everything. 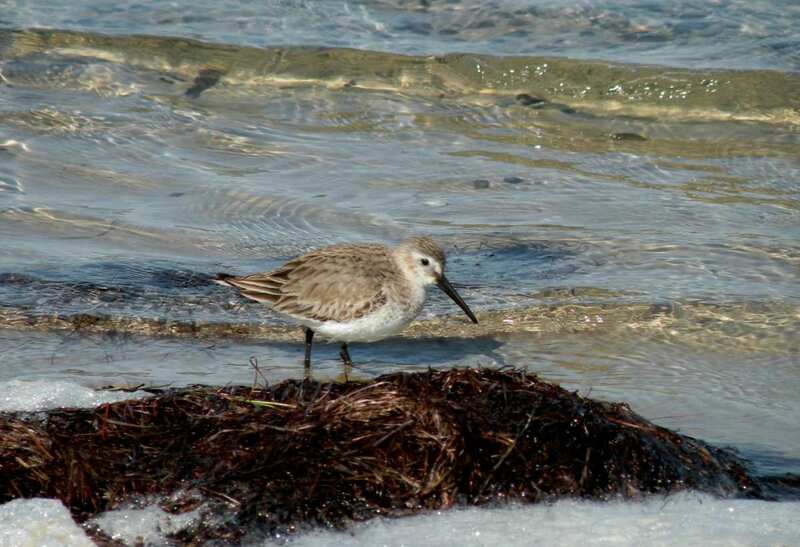 You'll See Many Sanderlings and White Pelicans on Padre Island. 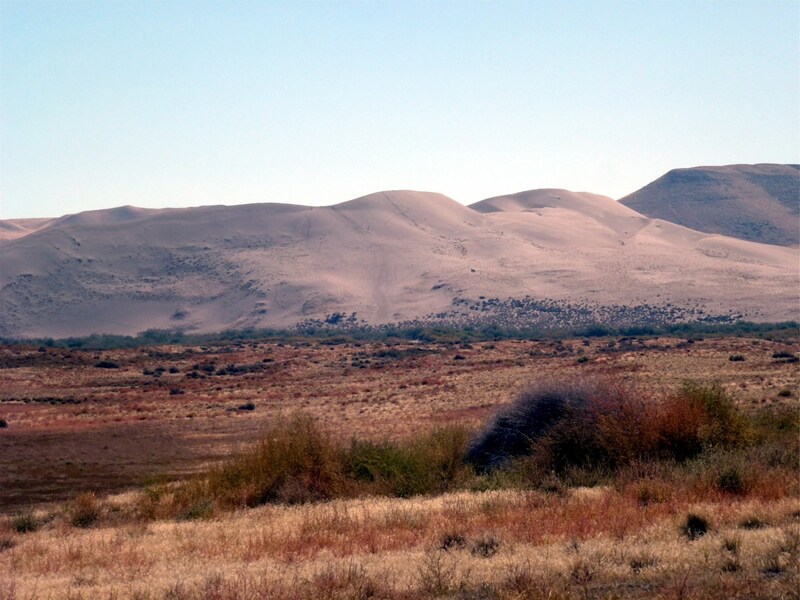 The Malaquite Campground is near the Malaquite Visitor's Center and is designed or RVs and motor homes. There are also 6 tent sites here, although tent campers are also allowed to set up their tents on the beach. Sites are quite close together, but each one has a shade shelter or picnic table of its own. The row of campsites on the beach side face the Gulf of Mexico, though you need to walk to the beach entryway to get out on the beach. Like most National Park campgrounds, this one does not have either electric or water hookups. There are restrooms with flush toilets and cold water showers. There is a dump station and a fresh water filling station just outside of the campground where you can empty your waste tanks and get fresh water. Be sure to read rules about use of generators carefully as the Park Service has strict rules about generator hours. You won't want to plan to use your microwave or electric appliances to make meals only to find out that you aren't allowed to run your generator. The beach in front of the campground is a great place to walk or to watch birds. 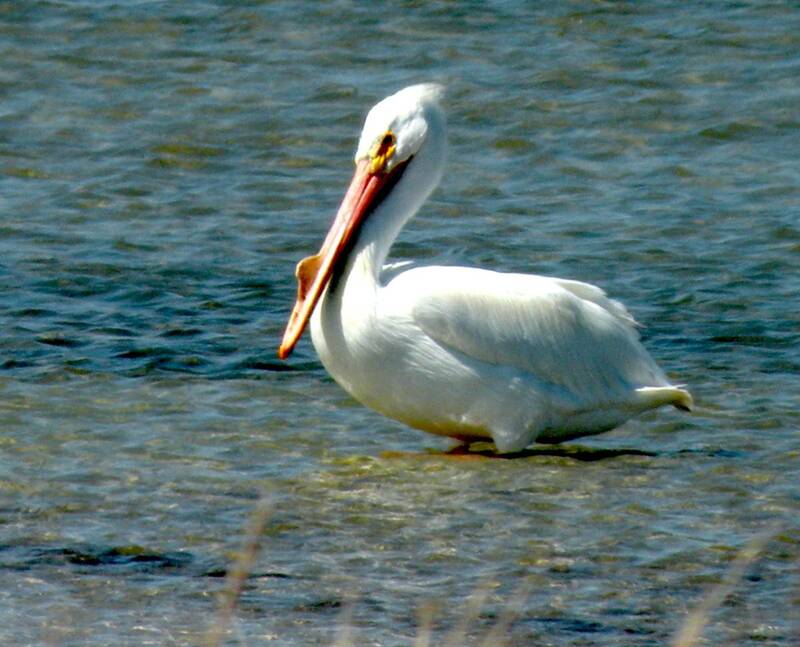 Pelicans make frequent flights along the edge of the water and are fun to watch as they dive for fish. Driving is not allowed on the beach in front of the campground, so it's a pleasant place to walk or watch birds. The camping fee at Malaquite Campground is $8 a night. Holders of the Golden Age or American the Beautiful Senior pass will get a 50% discount. Bird Island Basin in Padre Island National Seashore is a great windsurfing and camping spot. We discovered the Bird Island Basin Campground after we had already tried camping on South Beach (too windy) and camping at the Malaquite Campground (too close together). 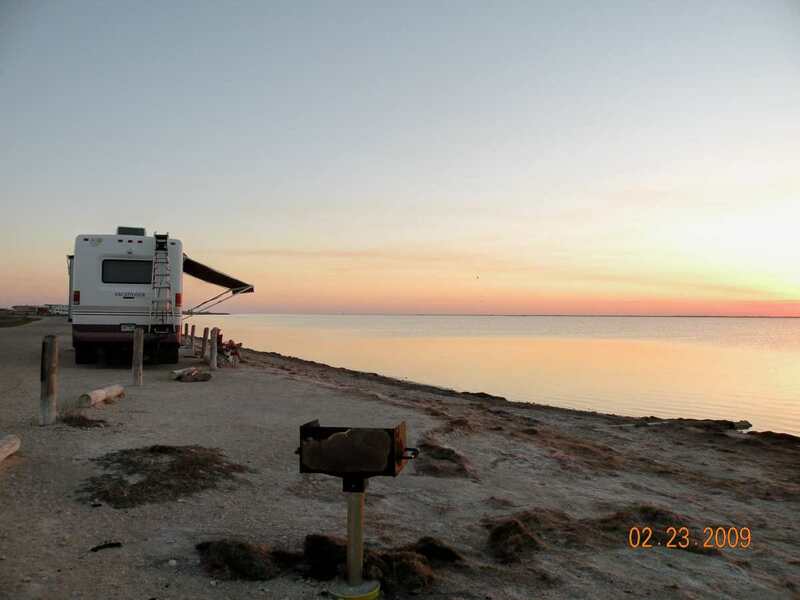 Bird Island Basin campground is on the Laguna Madre, a shallow saltwater lagoon with a sandy bottom. Camping here is primitive, with no dump stations or showers, but it is by far the nicest place to camp if you want privacy and a beautiful view. This is also an ideal location for kayaking, windsurfing, birdwatching and fishing. Camping at Bird Island Basin is $5 a day or $10 for an annual pass. There is a 50% discount for holders of the Golden Age, Golden Access or America the Beautiful Senior Pass. There are chemical toilets near the camping area, but, when you need to dump or get fresh water you will need to drive back to the dump and water filling station near the Visitor Center. 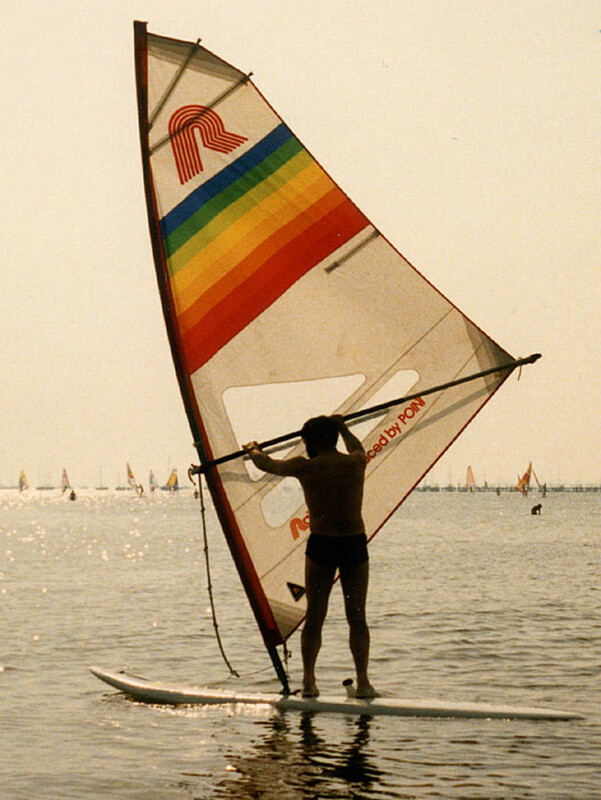 Bird Island Basin is used as a training location for beginning windsurfers as well as more experienced sportsmen. Those who are interested in trying the sport can rent equipment and sign up for lesson at the store not too far from the camping area. Camping right on the water's edge, we had a perfect view of beginner and expert windsurfers skimming the water and executing their complicated maneuvers in Bird Island Basin. Campsites at Bird Island Basin are parallel to the water, so we were able to park the RV with the door facing the water and set chairs and a table out in front of it. This gave us a front row seat for watching the many different kinds of birds that feed and swim in the shallow water. We often saw white pelicans, bitterns, great blue herons and other birds almost within arm's reach. In the evenings, the day visitors and windsurfers went home, and we enjoyed the beautiful sunsets on Bird Island Basin in quiet solitude. 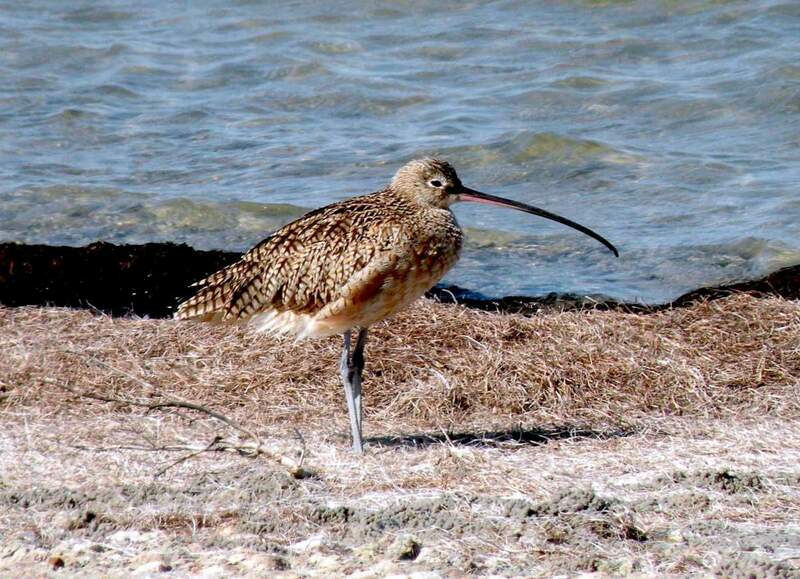 A Long Billed Curlew Hunts on the Water's Edge. 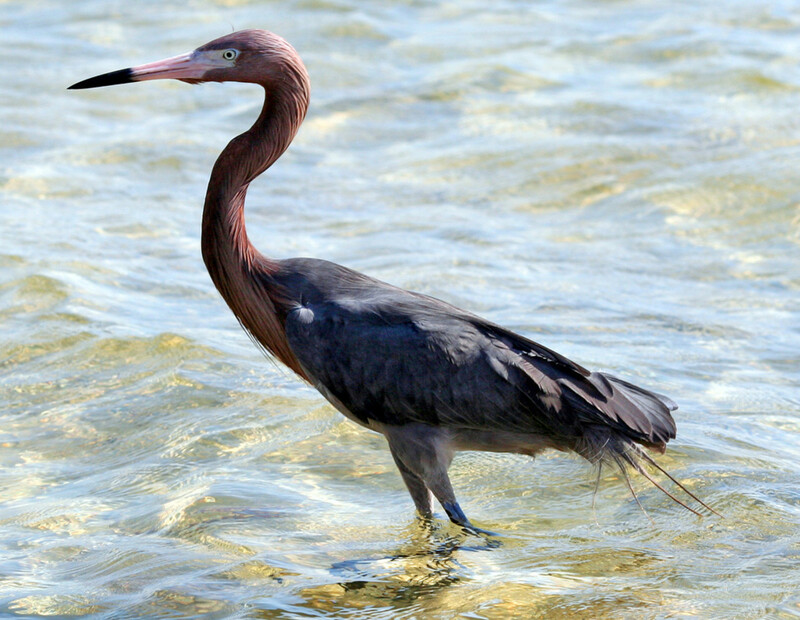 Reddish Egret Walks in the Shallow Water on Bird Island Basin. Padre Island is on the Central Flyway, a major migration route for birds traveling between North, Central and South America. Over 380 species of birds, over half the bird species of the U. S., may be on Padre Island each year. Because of this, many bird lovers come to Padre Island during migration season to watch birds. The Island provides a range of habitats including beach, coastal prairie, dunes, grasslands, wetlands and ponds which supply the bird population with an abundance of food and protection. 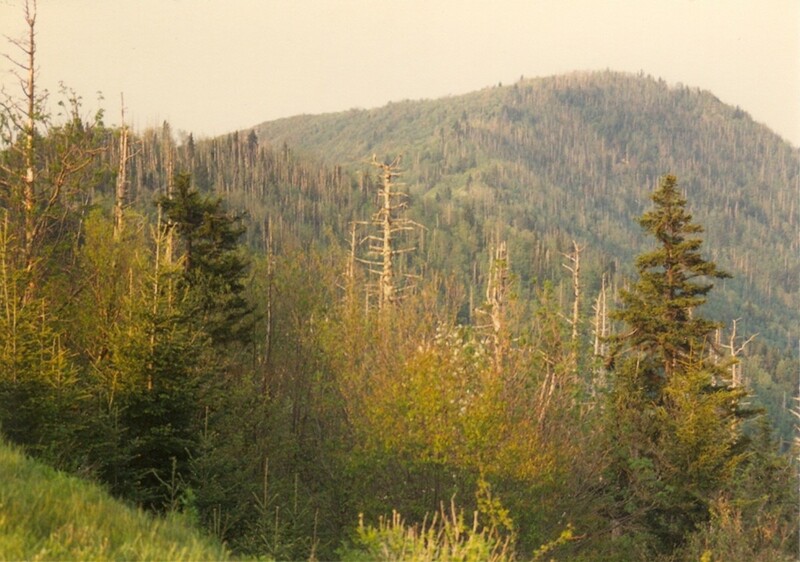 The location makes it an important and necessary stopping point for migrating birds who need to stop to rest and for resident birds who use the diverse habitat for nesting and breeding. There are 13 threatened and endangered species on Padre Island. 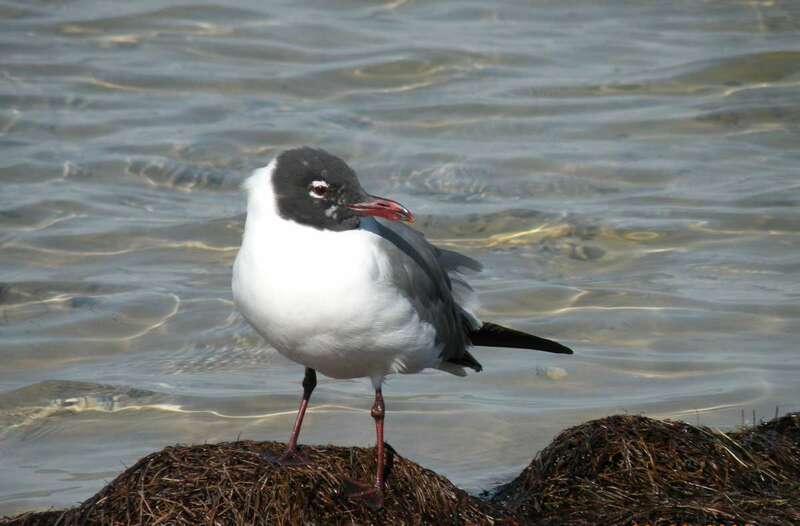 Concerned volunteers and staff of the National Seashore are working to conserve habitat that will increase numbers of these threatened and endangered species. We were pleased to be able to view several of these rare birds during our stay on Padre Island including the Wood Stork and the Reddish Egret. If you visit or camp on Padre Island, be sure to bring your camera, bird field guide and your binoculars or spotting scope. There are so many birds that you'll become a bird watching enthusiast even if you weren't one before your visit. Hi Mactavers, You can certainly find hotels in Corpus Christi, Texas which is a short drive from the Padre Island National Seashore. You'll also find some interesting things to see in Corpus Christi, and fun shopping along the waterfront. Have fun! Loved your Hub. I'm wondering if there are places to stay for those of us who do not have campers or other RVs. Is there a town nearby that would have motels? Johan Smulders - Padre Island can be very windy, making it difficult to tent camp. You do have to be prepared. Your 6 month road trip sounds great! Thanks for stopping by to read and comment! Also visited Padre Island at the end of our 6 month road trip and we did not have much time left. Our day there was very windy, and as we tent camped we decided to move on. A good and helpful article!Plan to go back one day. I will do the same! As I read your hub, I was thinking that our hubs on Padre Island would complement each other. Thanks for thinking of it! Woodamarc - It's a great place to visit, especially during winter when so many birds visit there. I'm definitely going to get back down that way one of these days. I love Padre Island. Great! Will look forward to seeing you, SgBrown! SgBrown - How nice to meet another RVer! I'm so glad that you found this hub useful. 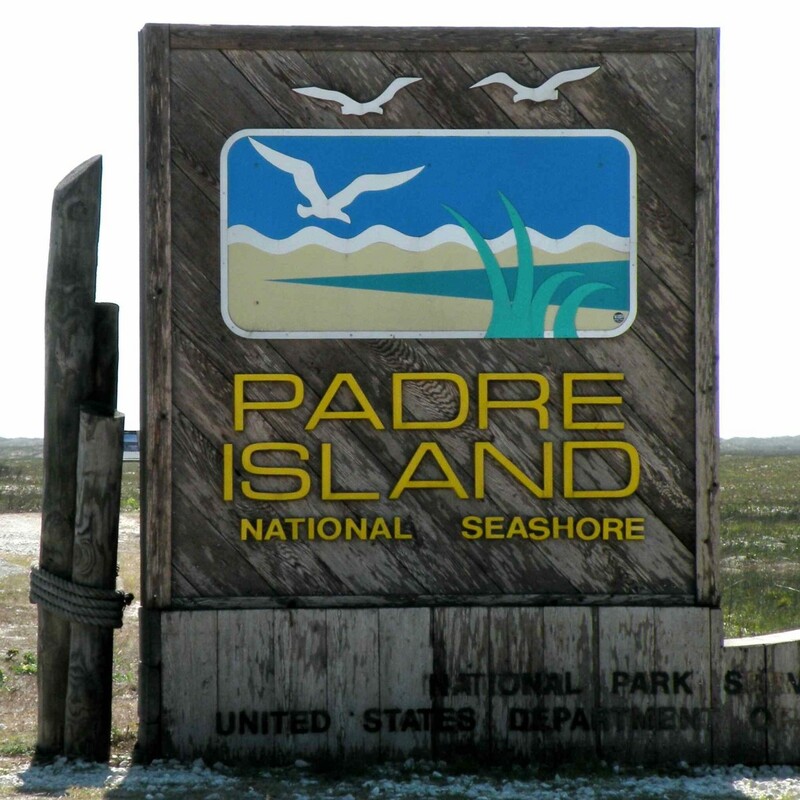 Padre Island National Seashore is a great place to visit, and we particularly enjoyed camping at the Bird Island Campground on North Padre Island. I'm sure you'll find many wonderful places to visit in your RV. Thanks for checking out my RVing hubs! Bigocean - One of the best things about RVing has been camping in places like Padre Island National Seashore and other National Parks where we have seen so many birds and other wildlife. Thanks for stopping by - glad to meet a fellow RVer! Thank you! I have an aunt that lives there and we are planning to visit this year. I will check out that hub, for sure. instantlyfamily - If your son enjoys birds, you might want to take him to Merritt Island National Wildlife Refuge in Florida (see my hub about it). It's a birder's paradise in February and March! 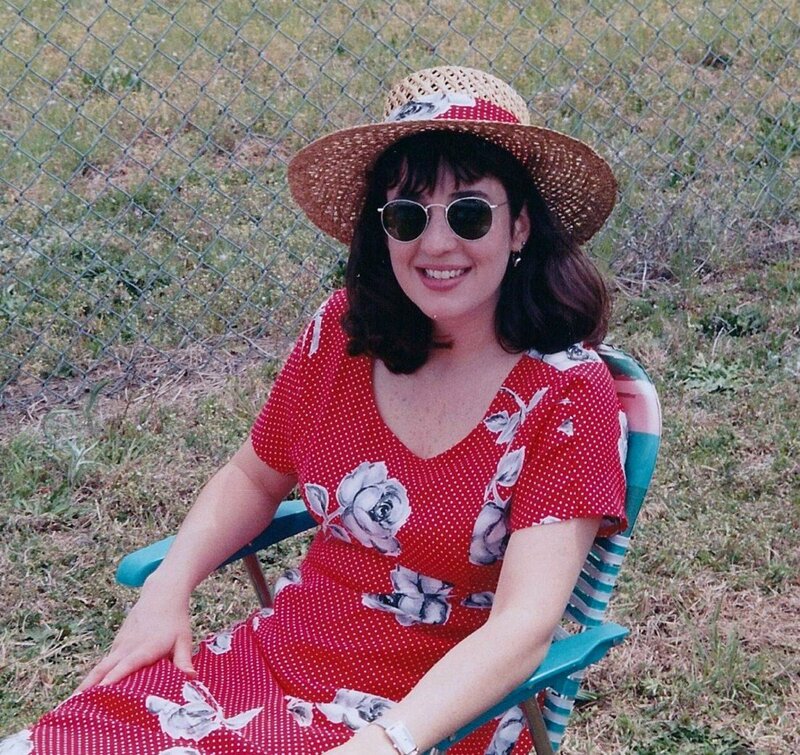 NMLady - We also loved Port Aransas. There are so many opportunities for bird watching in the area! How lucky you were to see the dolphins! 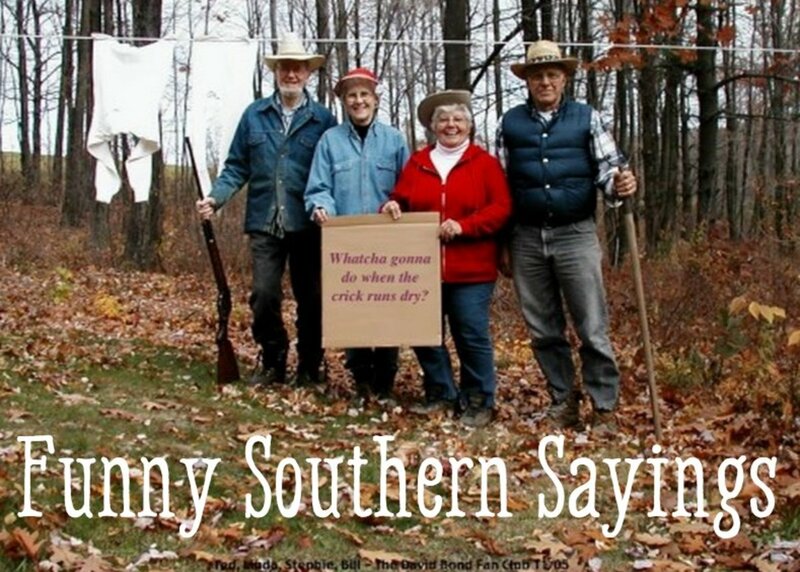 We've never seen them while camping in Texas, though we see them often in North Carolina. It sounds like you had a wonderful time! Thanks for sharing! Instantlyfamily - I'm so glad you enjoyed my hub on birding at Padre Island National Seashore! We saw many birds while camped at Bird Basin campground there. I'm sure that you son would love it if he's into bird watching. Nice hub! Great pictures. We spent about a month at Aransas Bay just up the coast. We took the tour to see the Cranes. We also got to watch dolphins in the bay. Our trip was during oyster season and those were good too! This is fantastic! I am adding this to my list of "Places I want to travel". My son is absolutely fascinated with bird species. Thanks for sharing this hub! I live in Sacramento now and it is 5 hours from the ocean. I miss the sound of the ocean. When you grow up near the ocean it becomes so much a part of you. The sound and smell are comforting. When I moved here... I could not sleep it was so loud and there was no rhythm to anything. Eventually, the trains became the rhythm but even still... it is not the same. 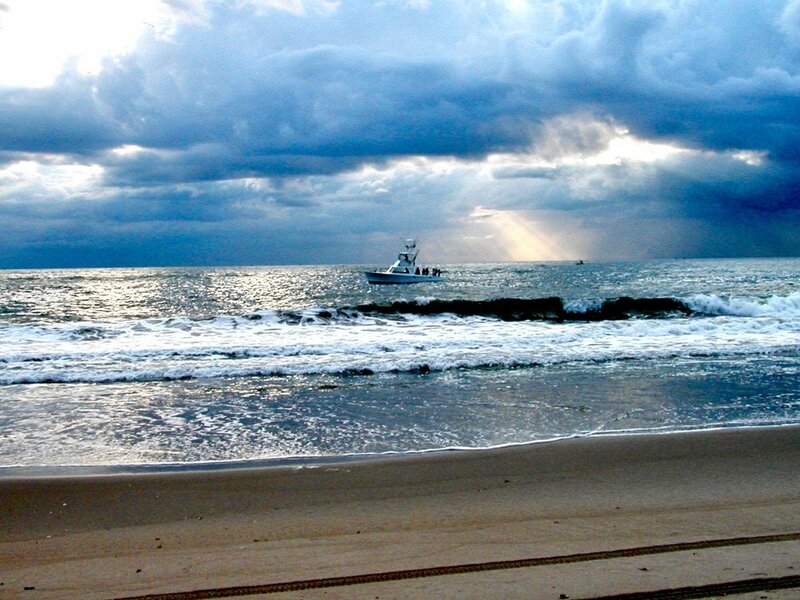 There's something about growing up near the ocean that leaves a lasting desire to be near it, isn't there? We loved RV camping on the beach on Padre Island National Seashore. Though it wasn't warm enough to swim, the birds were beautiful and I could get really close to them for photographing. Thanks for stopping by to visit my hub! Stephanie! Another great hub. I love the photography too. I grew up on the coast here in California and the blue warm waters of the tropics is something that amazes me. Here the water is warm when it reaches 55 degree and it is not clear at all. I loved that you can camp right on the beach and I understand how the sand blows into everything. Great hub! Just Ask Susan - It was lovely to camp right on the beach at Bird Island Campground on the Padre Island National Seashore. We loved watching the birds and the windsurfers, and just sitting out and relaxing! Full time RVing during the early retirement years is wonderful! Thanks for your comments, and glad you are enjoying my photographs! How wonderfully relaxing it must have been to camp right on the beach. I love the sound of the ocean. It's my dream to buy an RV and travel all through North America once my husband retires. Love all the pictures that you take. Woodamarc - Ahhh...the follies of youth! and the good times, too! Although we loved camping on Padre Island National Seashore, we did not swim in the Gulf of Mexico at that time. Nevertheless, we did enjoy being near the beach and enjoyed the great variety of migrating birds on the island. 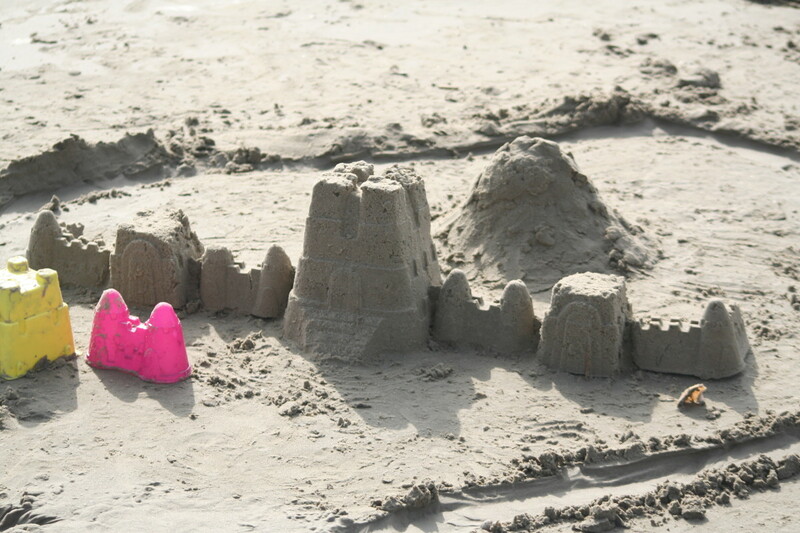 Thanks so much for visiting - hope you get back to Padre Island soon! This takes me back when going through my officers basic training at Ft. Sam Houston. Spent 2 nights on the beach with my buddies. One of the best times I've ever had. However, I don't advise floating aimlessly out near the piers. You ask why? The fishermen on the docks fish for the smaller hammerhead shark. Whether true or not, I listened to the old man on the pier and got out of the deep water. Youthfulness... Go figure. One day I hope to go back and RV camp. A beautiful area. Hi Happypuppy, I'm so glad you enjoyed the pictures of the pelicans and of Padre Island. I love to photograph birds, and the ones on Padre Island are great subjects. Thanks for visiting my hub and for your comments. You are a good photographer. Love the beautiful pelicans! Thank you, Peggy! The birds on Padre Island were very cooperative subjects. So many of them just stood still for their pictures. Thanks for stopping by to comment! You really got some great shots of the birds on Padre Island National Seashore. Useful hub for those wishing to camp and birdwatch. Thanks! We did love it there, especially at Bird Island Basin which was on Padre Island on the Laguna Madre. The birds had very little fear of us, and we had many opportunities to see them very close to our campsite. Thanks for stopping by to read and comment on my hub! RV camping on a beach sounds wonderful, especially with such a wide variety of birds so close to the campsite. I would love to visit Padre Island National Seashore – what an enjoyable visit that would be!